The use of structural features such as text size, font, graphics, color, animation, video and audio has been widely explored in the traditional media. Similar uses of such features have also been found in the online environment (Rodgers & Thorson, 2000). Factors related to consumer’s behavior, attitude, and perceptions regarding Web sites have been examined in academic literature (Chen & Wells, 1999; Coyle & Thorson, 2001; Ducoffe, 1996; Eighmey, 1997; Koufaris, 2002; Koufaris, Kambil, & Labarbera, 2001; Vijayasarathy, 2003). 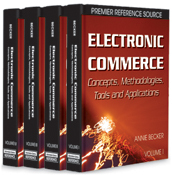 They include the investigation of effects of interactive features on Web site appeal (Ghose & Dou, 1998), and e-store characteristics on site traffic and sales (Lohse & Spiller, 1998). Some experimental studies examined the effects of animation and image maps on perceived telepresence and consumer attitude (e.g., Coyle & Thorson, 2001), and the use of pop-up windows on consumer decision-making processes (Xia & Sudharshan, 2000).